Santa Fe, New Mexico is a beautiful city situated on a high plateau at 7000 feet and surrounded by mountains. The Spanish founded a colony here in 1610, followed by Mexican traders and settlers in the early 1800s. There is also a strong Native American influence here. This blend of cultures, adobe artichecture, many museums and its laid back sophistication make this a unique and interesting destination for weekend getaways, girls getaways and Southwest vacations. We took our daughters here several years ago and we all thoroughly enjoyed this city and it's Hispanic, Native American culture and feel. Santa Fe is a great place to explore on foot. The city is centered around the Square. There are many shops, cafes, restaurants and attractions around and near the Square. The Native American Market is very interesting with its many craft and food items. It is held in the portico of the Palace of the Governors, the oldest public building in the U.S. and home to a display of Santa Fe history. 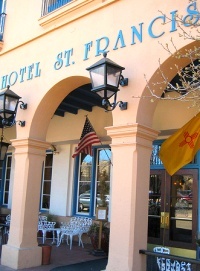 Consider a historic walking tour on your Santa Fe vacation. 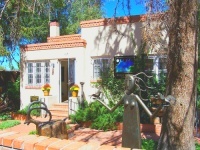 They can be booked through Access Santa Fe at 505-412-0472. Make sure and wander down Canyon Road which is lined with 90 art galleries and many indoor/outdoor cafes. The Santa Fe Southern Railway makes a 36 mile round trip between Santa Fe and Lamy. There are many museums to discover on your Santa Fe vacation. The Museum of Fine Arts showcases famous Southwestern Artists. For those interested in Native American artifacts and art, try the Museum of Indian Arts & Culture. The unique Museum of International Folk Art displays of large collection of folk art, both local and worldwide. Lovers of Georgia O'Keeffe, the famous Southwest artist, will be happy browsing the museum named after her. Check out the St Francis Cathedral which houses the oldest Madonna statue in North America. 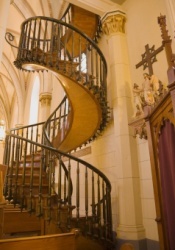 The Loretto Chapel, one of my family's favorite places in Santa Fe, is famous for the "miraculous staircase" built without nails or support beams by a mysterious stranger. The oldest functioning church in the U.S., built in 1610, is San Miguel Mission. Enjoy the great outdoors at Pecos Wilderness and Santa Fe National Forest with over 1000 miles of hiking trails. Ski fans will enjoy Santa Fe Ski Area which is only about 1/2 hour from town and open from Thanksgiving to Easter (also, chairlift from June-August). There are 8 Native American Pueblos near Santa Fe. Two that would be great to check out are Nambe Pueblo with beautiful views of the mountains, mesas and high desert. San Idelfonso Pueblo is famous for its etched black pottery. If you are looking for one of the top rated restaurants in Sante Fe, check out the sophisticated Geronimo with its unique New Mexican cuisine. For Italian food, there is Andiamo, a "neighborhood trattoria" using fresh local ingredients in a simple, intimate atmosphere. The Plaza Cafe opened in 1918 and serves New Mexican and Greek specialties at affordable prices. The popular diner-style restaurant, Tia Sophia's, has good food and cheap prices. Hope your Santa Fe vacation is most memorable!